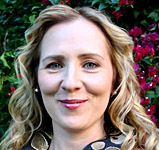 Kate Gale is the 2005-2006 President of PEN USA, and president of American Composers Forum/LA. Like many writers, Kate has taken the road less travelled. Rather than mourn the lack of literary community in her adopted city of Los Angeles, she decided to create one in the form of Red Hen Press, Los Angeles' literary jewel, The Los Angeles Review, a literary magazine, the Ruskin Art Club Poetry Series, the Geffen reading series, and a Writers in the Schools program for underserved communities. At forty, she completed her Ph.D in literature from Claremont Graduate University, ran her first marathon and climbed Mt. Whitney, the tallest mountain in the lower forty-eight. Kate Gale's Rio de Sangre, an opera with Don Davis was performed in part at Disney Hall November of 2005 and her opera, Paradises Lost, was performed in part at the New York City Opera in May of 2006. I want to discover the next Kafka, the next strange, undiscovered genius who others don't quite see yet. I want really good work whose value lurks beneath the surface. NEFF: Kate, as far as literary types go, you are most eclectic and accomplished, someone who makes things happen for herself, as well as for the good of others. Let's talk about your creations. Why did you start Red Hen press? KG: I wanted to create a place for really great writers who weren't finding a home because they weren't mainstream. I have never been normal, so finding a place for writers who weren't writing normal was perfect for me. I wanted those writers who wrote quirky and savage and outside and underside and raw to feel that someone understood who they were and would find them an audience. NEFF: What types of literature do you seek out to publish at Red Hen? KG: I want to discover the next Kafka, the next strange, undiscovered genius who others don't quite see yet. I want really good work whose value lurks beneath the surface. I am always perking my ears up for the wild alive writer whose work achieves mastery. NEFF: What are your frustrations with running a small press? Your triumphs? KG: In Los Angeles it's difficult to raise support in terms of people or finances. It's very expensive to live here and it's very hard to raise enough to pay my people a living wage in a city that is this ridiculously over-priced. Triumphs? ... Every book that I brought to light from the famous and amazing like Chris Abani, Deena Metzger, Eloise Klein Healy and David Mason to the new geniuses like Rex Wilder and Doug Kearny who haven't begun to show us what they can do, I feel very lucky to be in publishing. NEFF: Tell us about the Los Angeles Review? What prompted you to begin that journal? KG: I felt Los Angeles needed a journal with its name on it. I love this city and I am going to bring it forward as the literary home place that it is. NEFF: It appears from your mission statement on LAR that you hope a new literary movement will spring from the "caldron" of culture-mix in LA and CA. Do you have a vision for this movement? KG: Our diverse culture in Los Angeles is creating a swirl of literature. Lisa See is writing about being Chinese. An amazing writing. Susan Straight is writing about being African American. Octavia Butler wrote science fiction. John Rechy writes about many issues, but often about being gay, and/or being Mexican. To live in Los Angeles is to be part of a dynamic swirl of cultures that invites writers to reach outside the conventional boundaries of self into a surreal place where the self is mutable. I see this literature continuing. It's a vision for us here. We can be anything. In literature. In life. In our community. Los Angeles literature might be the model for American literature. Inviting a stripping away of boundaries. We are here at the edge of the world. We live in a city transformed from desert. The light pours through us. We could do anything. NEFF: Tell us a little about your other projects, like the Writers in The Schools program. KG: We bring writing workshops and books to schools in under served areas, in other words schools where the kids literally don't have books. We are often giving kids their first book. The students write to us that our workshop convinced them not to drop out of school. We go into inner city schools with a very high drop out rate and have the students writing their own poetry. The leap from nobody to creator is one of the most amazing leaps of faith a human being can make and we get to see it happen again and again. NEFF: How do you make a difference in literary America as president of Pen USA? What are your "duties" and/or opportunities in this position? What have you learned? KG: I've been President of PEN USA for two years. We work tirelessly to get writers out of prison in countries around the world where they are imprisoned. Many are journalists who want to speak the truth. This work is vital. Daniel Pearl was not an isolated incident, just a famous one. PEN also mentors writers here at home and has a PEN in the Classroom project. In every way, PEN USA fosters freedom of expression. It was my privilege to be involved. NEFF: Can you tell us about your current or most recent literary projects? You seem to be all over the place! KG: I write librettos to operas which is fun. Working with Don Davis, Stephen Taylor and Billy Childs is great. These guys are great composers but they treat music like their huge playground, I love being involved. I am also writing a novella and always writing poetry. I write to keep myself alive and maybe to keep myself out of trouble. But on any given writing day, I focus on one project. NEFF: What advice do you have for young literary writers faced with an ever-tightening fiction market and a world that pays far more attention to zombie video-games than it does to books? KG: Write what you love. Write if you can do nothing else. But know who you are writing for. Know what writers you love. And read everything. Don't worry too much though, let good work emerge. NEFF: What does Kate Gale see as the literary future of America? KG: We're going to keep reading. Because it's subversive and we love subversive. Because books are a pleasure like champagne or oysters or chocolate, a secret pleasure. Because books are a doorway. Because language is the doorway to being outside the house that Jack built. And I think Americans are tired of the house that Jack built. NEFF: What does the future hold for Kate Gale? KG: I will continue to do too much. But when I write, I write wholly, and when I am with my children, I mother fully and when I teach, I teach completely, and of course in everything else I do, I try to be fully involved and unforgettable. The future for Kate Gale is to be a force of nature. Because I'm just getting to the good part of my life. Where everything begins happening at once.